Pakalert Press » Hyperinflation Alert! Prices Rise to RECORD HIGHS! Hyperinflation Alert! Prices Rise to RECORD HIGHS! 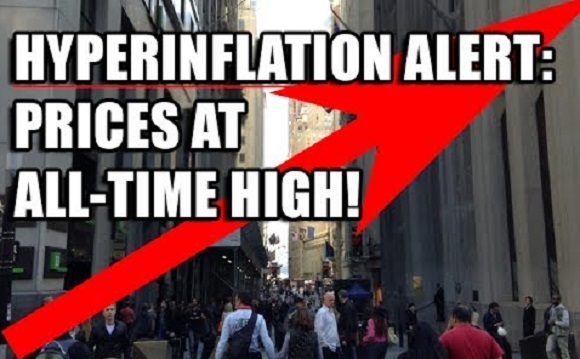 In my last comment I wrote that the U.S. is experiencing hyper-inflation. The true definition of inflation is currency devaluation. It is going to have a devastating effect on the vast majority of the people, especially those that are on fixed incomes and wages. The Globalist CABAL of the NWO of Elite Politicians, Bankers and industrialist will be insulated. The only method to stop this crimminal enterprise is to hit them in the pocket book. If everyone stop driving for a week to 10 days it ould have an effect.